About The Company « Yeadim Ltd.
Yeadim Institute Ltd founded in 1992 by Dalia Stenzler, engages in promotion, management, development, production, guidance, and assimilation of programs and products through a spectrum of tools and media and in leading change processes in organizations, institutions and companies. Yeadim’s expertise is in impounding resources as a tool for levering national projects, in a modular development by using a vast range of methods, tools and languages and in tailoring development solutions for customers. About 100 academics are employed in the company. Yeadim’s team is composed of content personnel, methodologists, research psychologists, instructors, producers and marketing specialists. Yeadim’s team specializes in providing methodological solutions leading to change processes, while developing programs and master plans according to needs, information management and developing content for assimilating change. Yeadim’s team develops a program for the customer, while instructing and training inner organizational bodies for independently leading the process. It also promotes, develops and creates independent products and projects according to the market’s needs. All the processes are carried out by means of unique methodological tools in a wide range of media such as: simulation games, box games, applications, activation programs, books, encyclopedias, and more. Yeadim is also engaged in producing events as part of a change process of the educational program, producing theme events, accompaniment, consultation, developing initiatives and impounding resources. Yeadim believes in servicing the customers through collaboration in providing suitable solutions for their needs. 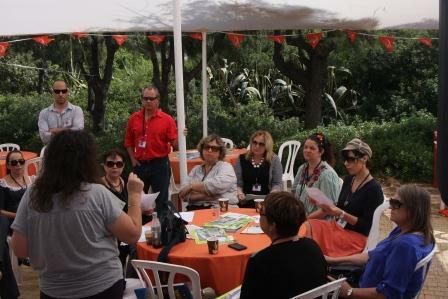 Yeadim’s activity is undertaken while recruiting stakeholders and working together at a round table. The synergy created contributes to levering the project both at the content and at the economic level. In this manner, unique and qualitative programs and change producing products are created.